When reading these memories, please be aware that the gravesite dates from 1841 and recollections of the site vary. Some people interviewed were in their twilight years and are drawing on memories of their childhood fifty to seventy years earlier. Alternatively, the appearance of the gravesite in the 1930's -1940's might be different to the way it looked in 1950. The following memories suggest there may be two different gravesites in the same vicinity. The gravesite (or gravesites) are located on the Section 24. Section 24 is the name of the original 100 acre lot sold for settlement. Early settler Frank Johnson sub-divided Section 24. In 1841, settlers Susannah and Anthony Wall agreed to purchase an eight-acre block of land sub-divided from Section 24. Their friend John Whitehouse bought an adjacent eight-acre block. It appears that the Wall's moved onto their block in the spring of 1841. The following extract is from a letter written by Susannah Wall to her sisters in December 18, 1842. The original is held in Alexander Turnbull library. In her letter, Mrs Wall writes of Bishop Selwyn visiting the gravesite on his first visit to Wellington. He travelled to Wellington by ship from Auckland and returned on foot, passing the Wall's home on his journey north. The spelling is as it appears in the text when it was published in Barbara and Robin Kay's book Anthony Wall, Settler of Porirua: The Papakowhai Story. "My dear Sisters I cannot omit tell you aboute the time as I received your letter the Bishop and several church ministers came in one is stationed at Wellington and the others at different plases in the countrey the Bishop as given the natives the Teustiment and comonprayer bok printed in there own tongue the Bishop walked through the country to see the natives at different plases and he called at my house it was aboute 4 oclock in the afternoon there was aboute 30 of the natives with him carry his tent and provisions and different things that he needed there is not houses for travellers to call at and accomadation as in england when night comes they must lie down rapt in there blankit and kindle a fire a poor woman at the neighbouring house ad died in the winter and the rodes was so bad at that time she could not be carried down to the burying ground in Wellington and she was burred with oute the buriel servise I told the Bishop and he whent with me and the poor womans husband to the grave and read the burial services I cant tell you my dear sister how I felt at that time but I daresay you can tell my feelings better than I can express my self he hoped if susch a case should happen again that the minister might be sent for and like wise if aney children should be born that he might be sent for to baptise them it happened before we whent to live there I don't think that I ever talked to such a spiritual minded man to all appearance in my life he shook hands with me and hoped that God would bless and propser me and rember the sabath day and keep it holy and when he come that way again he hoped he should have more time to stay and talk with me and he would give me some books for the chilldren"
Murray Henderson was a descendant of John and Janet May. The May's purchased their part of the original Section 24 on 30 July 1886 from Charles Pichoir de Launay who had recently built a house there. The May's named their farm Glenugie. They sold on 29 September 1900 and moved to Johnsonville. Murray grew up in Johnsonville, spent his youth wandering the hills of Glenside, and continued to walk in the area in his elder years. He was present when the archaeologist conducted her first site visit on 9 April 2008. "I saw that gravesite when I was a lad. It had white picket fences around it and a white wooden cross. That's what I remember." "I do believe that whether they find it or not, there should be recognition in the form of a tablet, stone or plinth. It can't be totally ignored." "Even if it isn't established where the site is, the fact it was there on that property is not a myth. Some of us still living remember it. We know it was there. My ancestors, the May family, lived at Glenugie from 1886 to 1900 and they looked across at it from the front porch of the house there. This fact was passed onto us by the family when we were growing up." "They looked across at it every day. It was there with a little picket fence, just as there were many little picket fences around graves, and wooden crosses and wooden compounds around gravesites. Many of them have fallen down now and they are only there if the family repair and strengthen them." Len Stebbings was born in 1909 and the Stebbings lived on the Stebbings Valley farm from 1863. The Stebbings farm boundaries was adjacent to Section 24 and the families lived within a short walking distance of the gravesite. Bill Hodge married Mina Oswald, whose family had bought the farm on which the grave was located in 1913. Len Stebbings recalls that Mr Hodge was fencing and disturbed the grave. "He hit wooden boards. 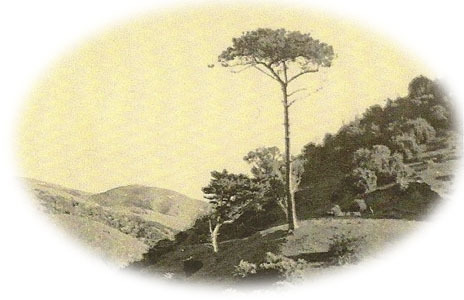 When he realised what it was, he planted lawsonia trees around it." Len Stebbings also recollected a bench-cut into a hill above the stream where a lone pine grew. He produced a photograph that showed the cut and shared his thoughts about it. "Now something that puzzles me is this photo. I wondered what this excavation was. Do you think the woman was buried up here? 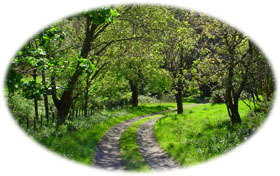 In the old days we used to see a lot of Maoris walking from Makara, over a track from Ohariu, through our property. This track wound around by the bush and came around the hill down the northern side of the stream. They followed around the stream to the old Porirua road and headed into Porirua that way. I don't know if this excavation is an old Maori track or not. It could be a grave site. It could be a house site. Mr Johnson was originally the owner of the farm and it may have been his wife who died. He got rid of the farm early and went to live in Johnsonville." David spent his childhood growing up in Glenside. His mother was van Weede nee Fitt and came to live in Glenside as a married woman in 1938. In his response to an e-mail question about whether he recalled a grave in Glenside and where it might be located, he first suggests the same location as Mr Len Stebbings. He also recalls a grave on the flat land across the creek. It's possible there are two gravesites. "Now the only one I'm aware of and I have to admit that it was a 'fable' is the site on the hill west of the farmhouse where there is a excavated flat area. It was thought that a family was buried here and I think there is/was a Maori track running through this part. You will see it on our old Glenside movie where a couple of trees come into view followed by a lone pine tree." "I can't remember who told me about the grave site, it was just one of those things that as kids you 'pick up'. The pine tree site was supposed to have hoops of wire buried there to mark the spot. No one to my knowledge saw any evidence of it. If I remember correctly there is an old Maori road/track that commences from that pine-tree site heading in the direction of the Stebbings farm." "You have touched a memory cord. Yes I vaguely remember the site. It's not where I thought it was but as you described opposite the old homestead. I can just remember a few palings (what were white a long time ago) fence in bad condition even in the 40's." The Broderick family first settled at The Halfway (Glenside) in 1845 and remained in the glen until 1965. Diana spent her first 18 years living here. "I seem to remember there was grave on top of the hill. There was a tree at the top of the hill. It's a matter of separating what is gossip and what is fact. I can't recall who told me this. I wish my Dad were alive because he would know. I know there was a woman buried there for a fact." The Rowell's lived in Glenside (The Halfway) from 1901 – 1911 farming the land adjacent to Stebbings. In 1919 the family returned to the area buying Ivy Bank Farm (Nott Homestead) and lived there until 1949. Rowell's have lived in the Glenside area ever since. Gwen lived at 12 Glenside Road on her marriage before retiring to Johnsonville. Gwen recalled visiting the grave as a child and in her later years. She said that at one time it was acceptable for the public to walk to the grave and the Hodges, who owned the farm at the time, enabled it to occur. "We were allowed to walk to visit the grave then. We walked down the driveway through the gateway and cut back along a path here beside the stream. There was a bridge, an old log, across the creek and some steps cut into the bank. You walked up them and onto the flat. The grave was along there." "It had a picket fence around it, a white picket fence. I used to paint it. Mr Hodge had it all looking nice. I would bring down fresh flowers to put on that grave. I remember walking up from the creek along the flat there to visit it." Relative of the Hodge family. Conversation in 2003. "As a girl I used to go down and visit my Uncle at Glenside. I remember the grave. If you were standing on the front porch of the house [Glenugie] it was across the creek and to the left. There were some orchard trees and a fowl house and the grave was fenced off there. We never went near it, it was sort of spooky I suppose. There were trees along the stream and a few were apple trees. I remember those because we would get the blackberries and then the apples." Joyce married Jim Hodge, son of Bill and Mina Hodge. "I cannot tell you where the grave was. Jimmy always said he would take me and show me, however the site was overgrown and there was blackberry so we didn't ever get there." Conversation held in 2005, when Mrs Pender was 85. "In those days we had a Sports Post. It came out on Saturday night. The Sports Post interviewed us at the farm about the grave. They took photographs and everything. Myself, I remember the big iron fence around the grave. It was a fancy iron fence. We never used that part of the farm, where the grave was. It was over by Stebbings Creek as it went around Stebbings Road. Gorse grew up around it. There were a few trees there and it was a bit hilly. We knew that he had permission to bury his wife there. He got special permission." When pressed, Mrs Pender could not recall who "he " was but said the Sports Post had the story. "I was a little boy growing up here. I always remember the site as flat. I used to sit in my Dad's truck as he drove past the grave. I would sit on the steps of the old house and look across at it. There was an elm tree by the creek. This elm here is the same one. [He indicates the tree]. I would look past the trunk, through the leaves at it. I do remember it was at the end of the piggery. Half the piggery has been pulled down now, so I have to estimate where it would be based on my memory of where the piggery ended. There was also a telegraph pole that I used to mark the site in my memory."